Cush, Punt, Saba, Aksum, Abyssinia, Ethiopia — the name of this country in Eastern Africa has seen many changes throughout thousands of years of history. Few nations have a similar long history and cultural tradition. Independent as far back as can be remembered, it was one of the “great” kingdoms for a long time. It is also considered the oldest Christian country. The Amharic language of Ethiopia and its accompanying script “Ge’ez” developed from Semitic origins in Arabia. Due to a more than 1600 year Christian tradition and the close relationship to the Hellenistic Mediterranean region during late antiquity, there are borrowings from Greek which can be recognized in the Amharic script. »Ge’ez« is the only script of Semitic origin which is written from left to right. Because Amharic is traditionally written with an expanded pen tip, it shows the typical ductus also characteristic of the uncial scripts of late antiquity and the early Middle Ages. So for experts in script, AMHARA has a somewhat sacramental effect. And, although the individual forms look foreign, the overall picture is strangely familiar. Typical for the Ethiopian script are the specially emphasized expanded verticals resulting from the horizontal position of the pen. The form which appears most frequently and thus influences the overall picture the most is the open bow at the bottom. The symmetrical bowl at the transition of the expanded to the light and again expanded determines the appearance of the font considerably. Also typical of Semitic scripts are the many forms of commas, serifs, rings and all kinds of additional “accessories.” With these so-called diacritic marks, the desired vowel sounds are added to the 28 basic consonant characters and consequently, 276 different syllable characters are attained. In this way there is a wealth of forms in the details which makes it possible to put together the components for European characters. At the same time, some forms hardly ever appear in Ge’ez: the individual straight stroke (as in I) and the diagonal stroke from the top right to the bottom left (only appears in Z). 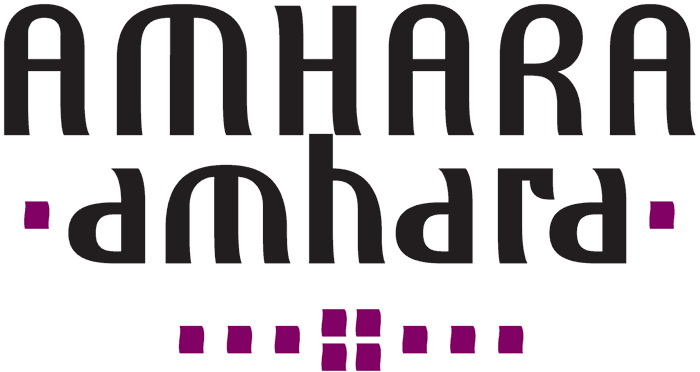 All Amharic characters have at least a hint of a stroke from the top left and a small downstroke at the bottom towards the right. To a great extent the attempt was made to retain this direction of movement in AMHARA. The lower case characters have a restless appearance (very intentional) and are not fluently legible. In this way the foreign and exotic impression of the African model is still present. 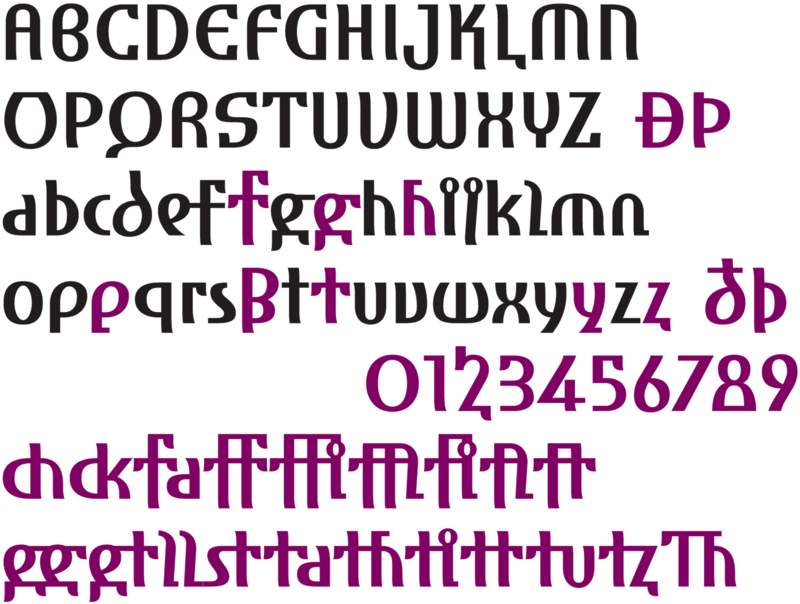 The upper case characters are a different story: In contrast to Roman capitals the Amharic characters almost completely do without acute triangular forms. For the usual square and slanted forms of our letters A E F K M N R V W X Y other solutions had to be found. In Ge’ez there are quick jagged characters, but only the form Z is transferrable. So the capitals of AMHARA receive a very pleasant, round appearance. A text in upper case characters of this font makes a calm impression as the same few basic forms are continually found in the diverse characters. Seldom does a text in capitals have this gentle effect. AMHARA includes a number of ligatures which dispose of many non-attractive letter combinations: ch ck fa ff fi fl ffl ffi ft gg gt ll st ta th ti tt tu tz. 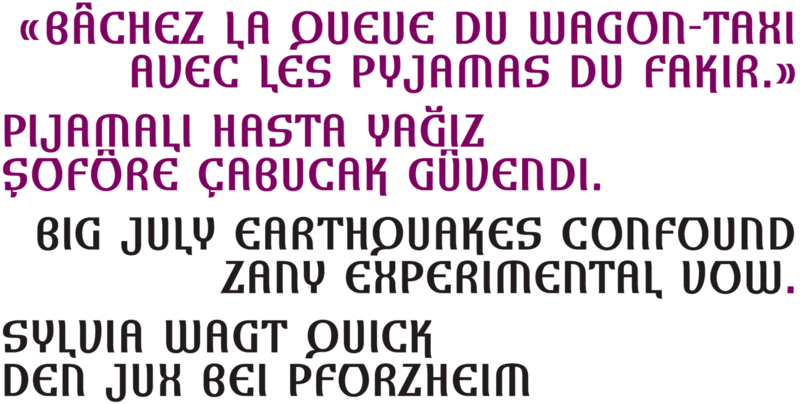 Stylistic alternates are available for the letters f g h p t y z. © 2019 ingoFonts Ingo Zimmermann. All rights reserved.